Ah, a folio game. I think the first time I purchased and played one was in the mid 1970s. These are usually about one battle, with a small number of counters and a short rule book. That is not to say that the folio games are simple or beer and pretzel games. The folio games are simplified compared to larger board games. The small map and easy to understand rules means that players need not take up too much space for too long. 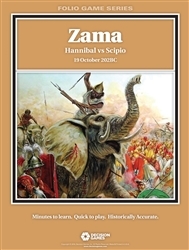 The battle of Zama was fought in October of 202 B.C. It would mark the end of the Second Punic War between Rome and Carthage. Hannibal versus Scipio: what else could a wargamer envision? This is one of the few times that military masters have met on the field of battle. The Second Punic War happened because of Hannibal's trek first through northern Spain and then France to invade Italy in 218 B.C. The actual battle of Zama occurred because of Scipio's invasion of the Carthaginian homeland, now in modern Tunisia. One of the reasons that the Carthaginians had run rings around the Romans for most of the war was their use of their allies' (the Numidians) light cavalry. Numidia was one of the few places that the Romans never actually conquered outright. It was to prove a thorn in their side a hundred years later. Scipio was able to get the use of the Numidians at this time under their King Masinissa. The Numidians had switched sides in the war because of Scipio's invasion. After Scipio's invasion of their homeland, Hannibal was recalled from Italy. The stage was set for either Scipio, and his veterans from his conquest of Spain, or Hannibal who had never been defeated in the field to win this final battle of the Second Punic War. The game is normal for a folio or magazine wargame. The map is 17"X22", and there are only 100 counters. The rule book starts with the standard rules for the series and then gives you the separate rules for the Zama game itself. The hex scale is 150 yards. The documentation lists playing time as one to two hours. The complexity is listed as low, and the suitability for solitary play is listed as high. I can attest that it is easy to play the game by oneself. Of course almost all board wargames can be played solitaire, although with some you have to fiddle with the rules or actions more than others. The counters are also standard fare for these types of games. They seem a bit thinner than I remember, but perfectly useful for their purpose. You will need to cut your small cardboard armies out, and if you are so inclined cut away some of the extra cardboard from some corners. I never felt the need in any game I own, but I know a lot of people also clip the counter corners. To each their own. The graphics on the counters are also fine, but not striking. You can easily see the numbers and read anything written on them without a problem. The Romans and allies have a red background, and the various Carthaginian forces have a purple one. The one point on the counters that is purely subjective is the strength and quality of each unit. The Leader units add a 'strength additive' number to any unit they are with in a hex. In this game Hannibal is given a '3' and Scipio is given a '2'. There are many, although I am not among them, who believe that Scipio was the greatest Roman general ever. I do not have a problem having Hannibal have a higher combat rating than Scipio. This shows the versatility of board games. If you choose you can change the numbers to what you believe is correct. You could even make your own counters and substitute them for what you, or whoever you game with, feel should be more 'correct' numbers. While some computer games have editors that can help with these changes, most don't and you are stuck with developers' ratings on units and leaders. The game piece setup in this game is again standard for ancient warfare games. Most battles were fought on flat ground, so many times terrain wasn't an issue at all. With Zama, the entire battlefield is made up of 'clear' hexes. The map is marked with where you are supposed to put your counters for each side. There are rules for variable deployment so you can try out different strategies once you get the game rules down pat. Another few rules are in place to make the Carthaginian player follow Hannibal's game plan. One of these is to force your elephants to move, on turn one, into a Roman piece's 'zone of control', or adjacent to a Roman piece. Any elephant counter that does not do this is considered to have run amok and is eliminated. The other rules make it so the different commands of Hannibal's army are released to attack the Romans at different times. So the second and third line of Hannibal's troops can only move once a Roman piece moves to 'X' hex line. Hannibal's plan was to try and tire the Romans out by attacking them in waves. 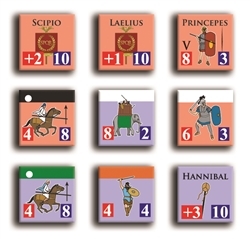 These rules are put in place to show how the actual battle was fought, but again once you are comfortable with the game it is flexible enough for you to use free movement for all of the Carthaginian troops. The Romans have no movement restrictions placed on their troops. There is also another ancient wargame standard, 'the berserk elephant rule'. Elephants were notorious for being both battle winners and losers. If the elephant unit receives a retreat or a hit (1/2) on the combat results table it becomes berserk and immediately charges off in any of six directions, decided by a die throw, and attacks whatever is in its way, friend or foe. The command and control rules are meant to simulate the problems of commanding an ancient army in battle. The troops are split into sub-commands for this rule and each sub-command must make a one die roll throw for each movement phase. If they are successful with the die roll, that sub-command can move that turn. There are four sub-commands for the Romans, and five for the Carthaginians. For example, the Roman citizen legions have to roll from a one to a five to be able to move that turn; if they roll a six they are unable to move. This also puts the element of surprise into the game. There is nothing worse that coming up with a great battle plan and then realize you cannot follow it because your troops are not in control this turn. The game uses another old friend to compute losers and winners in attacks: the 'combat result table'. By simply adding up the attackers points and the defenders, while adding or subtracting for leaders etc., you divide the numbers and come up with a number for the odds of the combat. If you have 8 attacking points and 4 defending, the odds would be 2-1. You check the 'combat results table' on the equivalent column and then roll one die. The one to six result is then taken on the counters. I know most of us are old hats at this, but we need new blood in the hobby. We as grogs are getting older by the day. These folio games are perfect in their complexity, price, and size to attract new players to our hobby. We don't want them running away by pulling out an old 'Europa' game first off. The game play is quick and tight, and the rules are not going to have you scratching your head. For us old players it is a trip down memory lane with a well conceived old friend. For anyone that is looking to get their feet wet into board wargames it is also highly recommended. There are many eras and wars that fall through the cracks of computer wargaming, so it is lucky for us that there are still companies like Decision Games making board ones. if you missed it, board wargaming has been having a resurgence lately, and that is also good news. There is one point about the Carthaginian setup that I had Decision Games answer a question of mine with it. 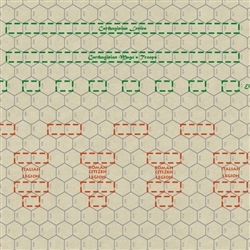 On the map there are three Carthaginian setup hexes for cavalry on both sides of their infantry setup, but the game comes with only four Carthaginian cavalry counters. As I assumed, you just use two cavalry units per setup area. Thank you for the review Robert. I also played folio games in the 70s. I just bought Zama and am about to play it for the first time. Thank you for the info about the Carthaginian cavalry start locations. I was a little confused. I too believe there must be some mistake in the carthagianian counters. Probvaly missing two cavalry counters.